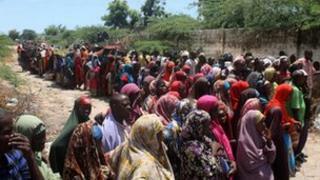 Three months after famine was declared in Somalia, the scale of the crisis in the Horn of Africa remains huge, says a British official. International Development Secretary Andrew Mitchell said hundreds of people, mainly children, were dying every day. According to new figures cited by Mr Mitchell, British aid is feeding more than 2.4m people across the region. The coming rainy season is expected to bring disease to crowded refugee camps. In Somalia alone, Mr Mitchell points out, more than 400,000 children remain at risk of death. Health has had a high priority in British aid that has come to the region - 1.3m people being vaccinated against measles, for example, while 400,000 doses of anti-malarial medication are currently on their way to Somalia. While the rains can bring more misery and death in their wake, they can of course be part of the recovery from this disaster too. More than 200,000 people are being given UK-funded seeds to plant when conditions have improved. The greatest challenge continues to be reaching those in need inside the parts of Somalia worst affected by conflict, where famine was first declared in July. As a measure of the challenge, the number of Somali refugees crossing into south-eastern Ethiopia has been steadily rising again.